Residents of the villages near Volcán de Colima, which marks the border between the Mexican states of Colima and Jalisco, know what it's like to live in the dangerous shadow of the most active volcano in Mexico, which has erupted more than 40 times since 1576. But this week's eruption exceeded the magnitude of all explosive events in the last 20 years. And if history repeats itself, some geologists fear the recent activity could be only the beginning of a larger event to come - one that could parallel or exceed the last major explosive eruption in 1913, which turned the summit into a 500-meter-deep crater and produced ash falls as far as 700 kilometers to the northeast. Volcàn de Colima (left) emits steam even on a relatively calm day. Nevado de Colima (right) is not active like its neighbor, but remains the taller of the two at 4,240 meters above sea level. Photo copyright of James Allan, 1981 (Smithsonian Institution). At about 11 p.m. local time Monday, June 6, Colima volcano erupted, producing an ash plume that rose up to 5 kilometers (16,400 feet) above the 4-kilometer-tall volcano, and sending pyroclastic flows of ash and rock down the flanks. The plume spread and blanketed nearby villages, Tonila and San Marcos, in a layer of ash, according to an AP report. Evacuation was not mandatory, but officials restricted access within an 11.5-kilometer radius from the summit and warned residents 30 kilometers away in the capital city of Colima to wear masks. "The eruption Monday sent a lot of ash into the city, causing respiratory problems," says Jim Luhr, director of the Smithsonian Institution's Global Volcanism Program. "But that's the least of their worries." What researchers and the surrounding communities fear most is a collapse of the volcanic cone. The volcano, sometimes also called Volcán Fuego (or "Fire Volcano"), rises from a 5-kilometer-wide horseshoe-shaped caldera at the western end of the Mexican Volcanic Belt. Repeated eruption of lava flows and pyroclastic material over thousands of years built the volcano's conical shape, but collapse events have created an "apron" of avalanche deposits around the southern base. Luhr says that the city of Colima and many towns to its north are all built on earlier deposits, and might be threatened by a future collapse. The caldera in which the modern cone sits is the scar left from one or more of the most recent collapses. According to Luhr, many collapses have occurred in the history of Colima, the last one 3,500 years ago. "The active cone is probably now as high as it has ever been," Luhr says. Also, researchers worry that heated water interacting with the once solid rock of the cone can weaken it, as indicated by pink and yellow coloration in the rocks. "This commonly feared pastel coloring," Luhr says, "indicates weakness in the deposit and the potential for a collapse." 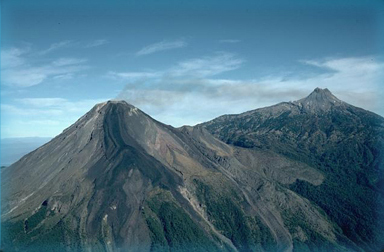 But a collapse of the mountain is the worst and least likely of three possible future scenarios evaluated by the University of Colima's volcano observatory. A second scenario is a continuation of the activity that has occurred since 1998, with additional eruptions similar to Monday's that will drop ash on nearby communities and generate pyroclastic flows that travel out to about a 5 kilometer distance. A third scenario involves an enormous eruption on the scale of the 1913 event. Even in this case, however, the city of Colima about 45 kilometers south of the volcano would not likely be in much danger, Luhr says, because typical wind patterns move north. "But anything can happen and winds can change," Luhr says. The cloud from Monday's eruption moved southwest. Geologists look to the composition of ejecta during eruptive episodes as one way to evaluate the potential threat. The current episode of activity began in 1998 and has included the growth of lava domes, flows of lava and ash, and multiple eruptions. Researchers found that new magma had been produced during these events, Luhr says. But for an explosion on the scale of the 1913 event to occur, the magma must retain its water until it reaches the surface. Since 1913, water vapor has always beaten the magma to the surface. "You could see gases streaming out before the magma," he says. The eruptions to date have been powered by the expansion of heated groundwater. Colima's behavior appears to by cyclical, Luhr says, and current events are similar to those that preceded the 1913 explosion. The question remains as to why the magma sometimes retains gas up to the point of eruption and, other times, the gas bleeds out prior to eruption, he says. "We still don't know if Colima's current magma is gas-rich or not, but evaluation of recent ejecta is underway to address that question." Ejecta with a glassy texture and is full of holes, for example, would imply that gas-charged magma has reached the surface and that Colima has "entered a new phase of activity," Luhr says. "The people surrounding Colima have quite a dangerous situation on their hands." In the meantime, the University of Colima's volcano observatory issued reports that local villages should remain on alert and under voluntary evacuation. Some chose to leave, but many have grown wary of multiple evacuations during the period of high activity beginning in 1998. Monday's eruption was just another event in "a long and tortuous experience for these people," Luhr says.